The French economy finished 2018 on a firmer footing than expected even after violent "yellow vest" protests that hit retailers especially, but growth still fell short of the government's target for the full year. Data from the INSEE statistics agency yesterday showed the euro zone's second-biggest economy grew 0.3 percent in the final quarter of 2018, the same rate registered in the previous three months. The growth was driven largely by exports, which helped offset a slowdown in consumer spending as waves of anti-government protests forced many stores in Paris to board up during the crunch pre-holiday period. It nevertheless meant the French economy grew 1.5 percent for all of 2018, short of the government's forecast for 1.7 percent and down from a decade-high rate of 2.3 percent the previous year. The first half of the year was even weaker than the second, with a tax hike hitting consumer spending in the first quarter and transport strikes weighing on second-quarter growth. President Emmanuel Macron's government also expects the economy to post 1.7 percent growth this year, which would put France ahead of Germany for the first time in decade. The German government is expecting only a 1.0 percent expansion. Desperate to contain the uprising testing his authority, Macron announced wage increases in December for the poorest workers and a tax cut for most pensioners. The package of measures, which puts 10 billion euros into consumers' pockets, should give household spending a shot in the arm, a senior finance ministry official said. "With what people have been saying about growth being much weaker, today's figures give us comfort in our growth forecast," the official said, adding the 2019 forecast would be updated in April. The finance ministry estimates that the yellow vest protests, named after the high visibility vests French motorists must keep in their cars, knocked 0.1 percentage points off growth in the final three months of 2018. "Fourth quarter growth proved robust, despite the hit from protest action. But there are signs that underlying economic momentum has slowed," Morgan Stanley economist Matthew Pennill wrote in a research note. 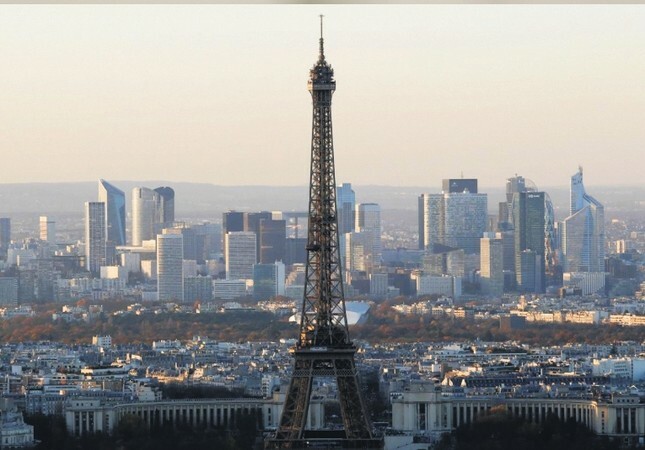 Household spending - traditionally the motor of French growth - slowed to a standstill in the quarter after expanding 0.4 percent in the previous three months as Paris saw the worst street violence since the 1968 student protests. Meanwhile, business investment also slowed sharply, to growth of only 0.3 percent in the quarter from 1.7 percent in the previous quarter as business confidence collapsed amid the unrest that left many Paris shopfronts boarded up. An end-of-year spurt in export shipments helped lift growth. Export growth came in at 2.4 percent, outpacing import growth of 1.6 percent. In recent years, France has seen exports surge late in the year as Airbus rushes to ship aircraft before year-end, triggering a concomitant drawdown in inventories. That export spike has often been followed by a first-quarter slump.